Observing This is the skill of using our senses to gather information about objects or events. This also includes the use of instruments to extend the range of our senses. Using apparatus and equipment This is the skill of knowing the functions and limitations of various apparatus, and developing the ability to select and handle them appropriately for various tasks. . Play with the Mass Scale Model. Test what you've learned by trying the input field. This Mass Scale Model allows the skills of reading from a circular scale of a typical weighing scale. The three options available allows for student's own testing of the different scales with different decimal places of precision appropriate in each scale's smallest division. Students typically can tell masses of whole numbers such as 600 g, but to be able to type in 0.60 kg requires some understanding of decimal places. 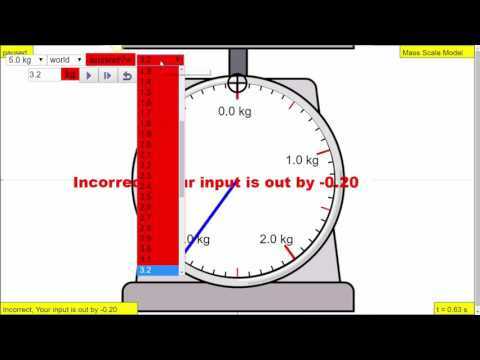 (g) describe how to measure a variety of masses with appropriate accuracy by means of weighing scales. This simulation has touch sensitive controls for the pointer and the actual reading (yes, i need to program for these features) which other app may not have. My sincere gratitude for the tireless contributions of Francisco Esquembre, Fu-Kwun Hwang, Wolfgang Christian, Félix Jesús Garcia Clemente, Anne Cox, Andrew Duffy, Todd Timberlake and many more in the Open Source Physics community. optimised for 4 and 5 kg. optimised and comes with better control of screen. arrow up and down controls the zoom level, useful for small devices.